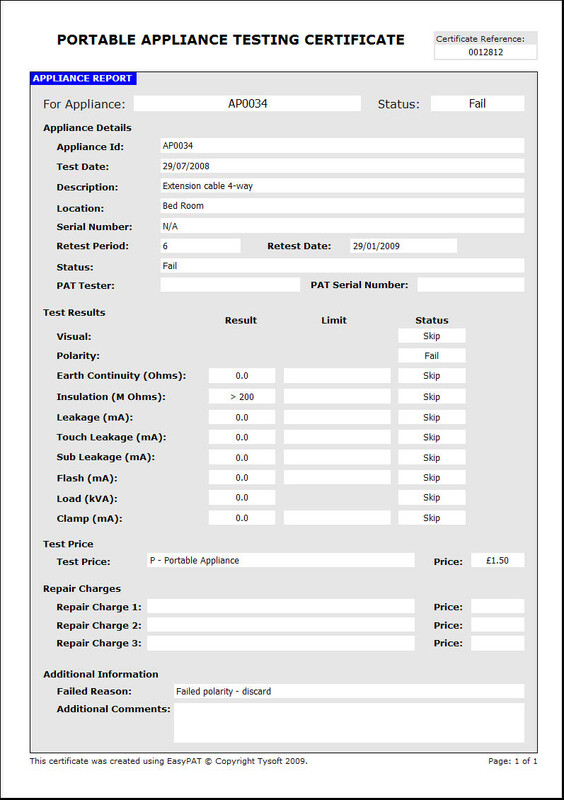 EasyPAT is used to print Portable Appliance Testing certificates onto plain or company headed paper. 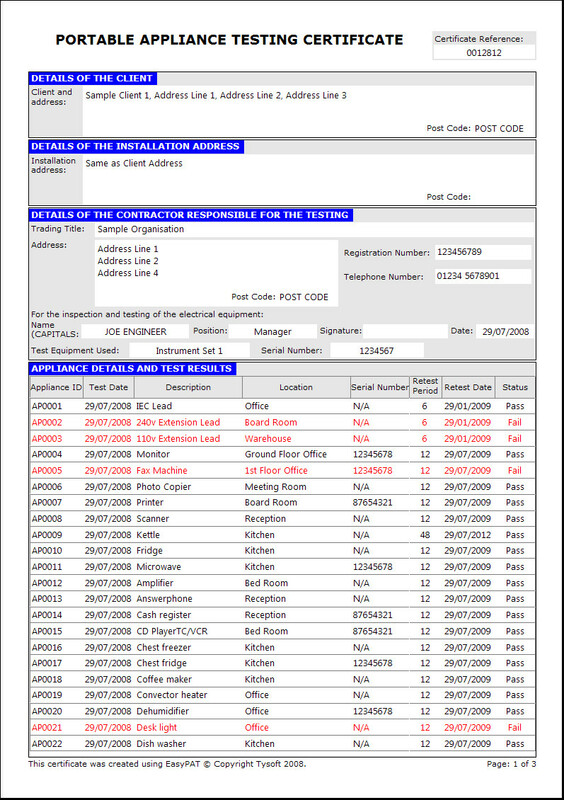 EasyPAT produces professional looking certificates quickly and easily. 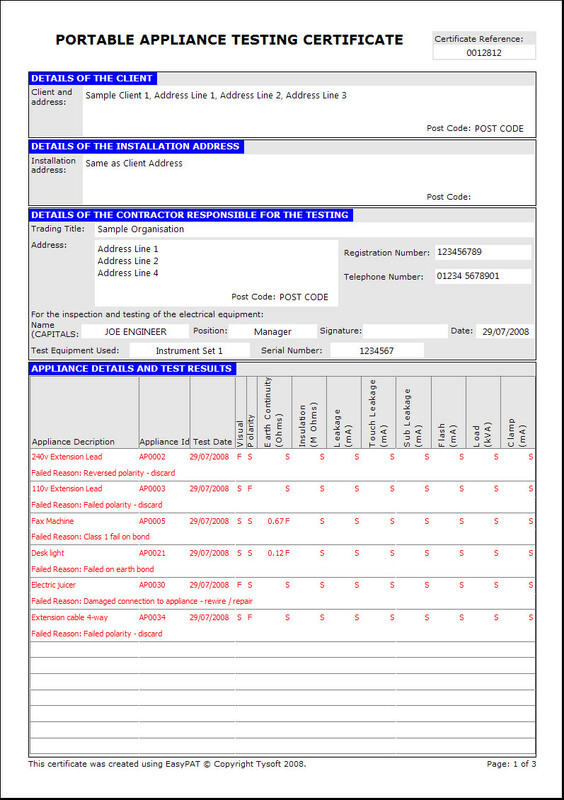 Certificates can be filled in onsite or at the office and then quickly printed or even emailed direct to your client. 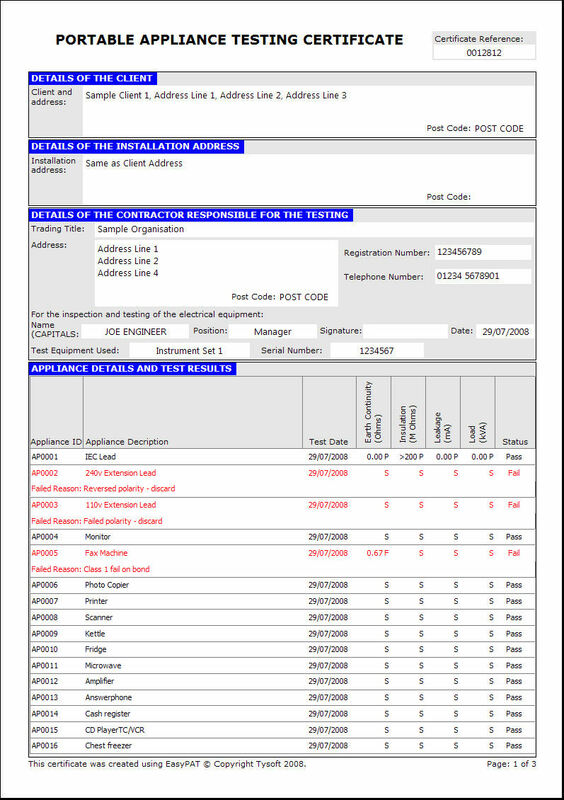 All certificates can be printed directly onto plain paper, along with your company logo and electronic signature if required. 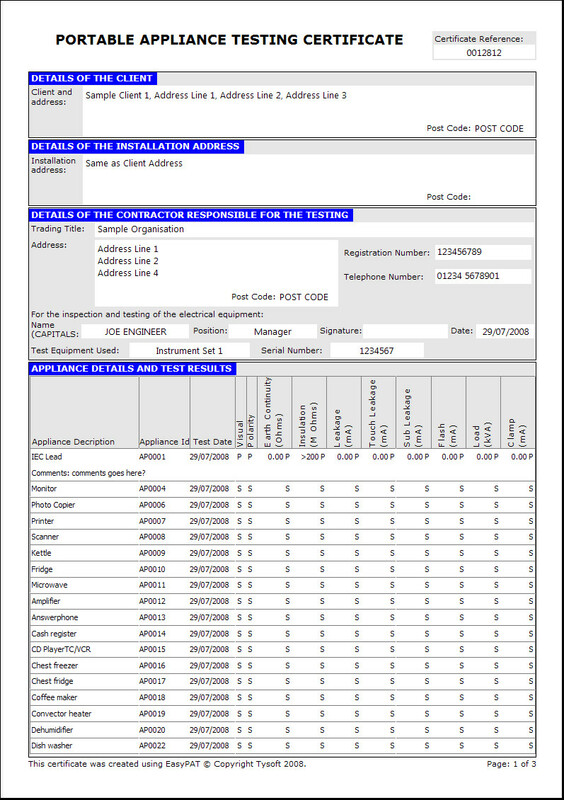 A range of certificates can be printed for your records, including an appliance register showing passed and failed items, or print detailed reports showing test results and failed reasons for each appliance. 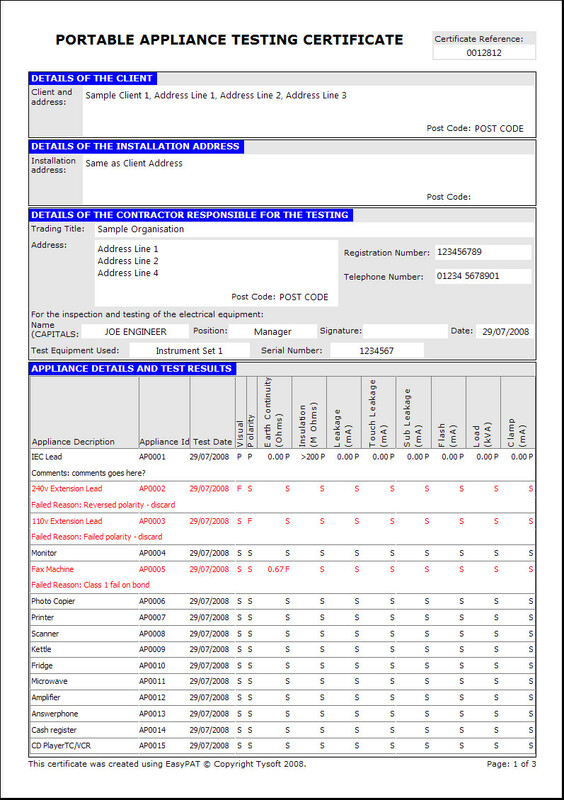 Completion Certificates can also be printed to be given to your customer. 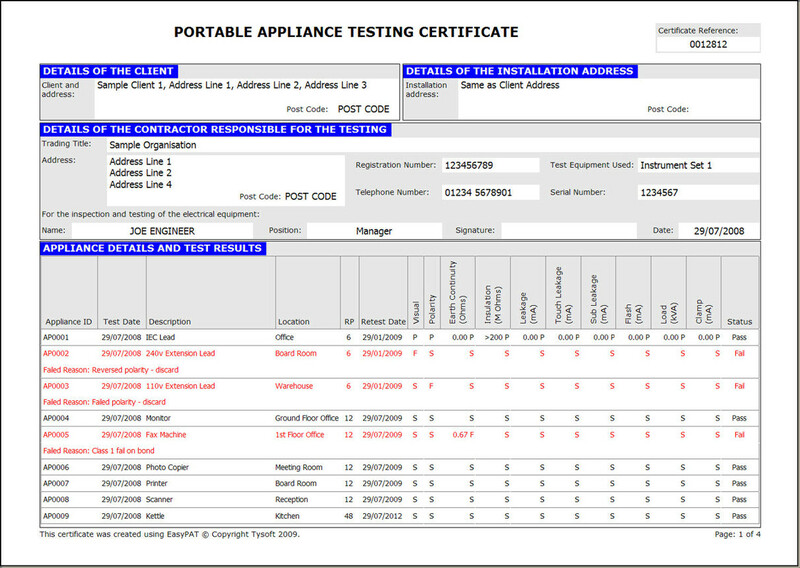 A full range of test results can be entered for each appliance which can be seen in the screen shots below. 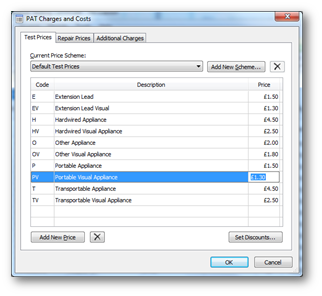 EasyPAT provides many common dropdown menus when adding and editing appliances. This saves you time and effort by not having to type the same information each time. 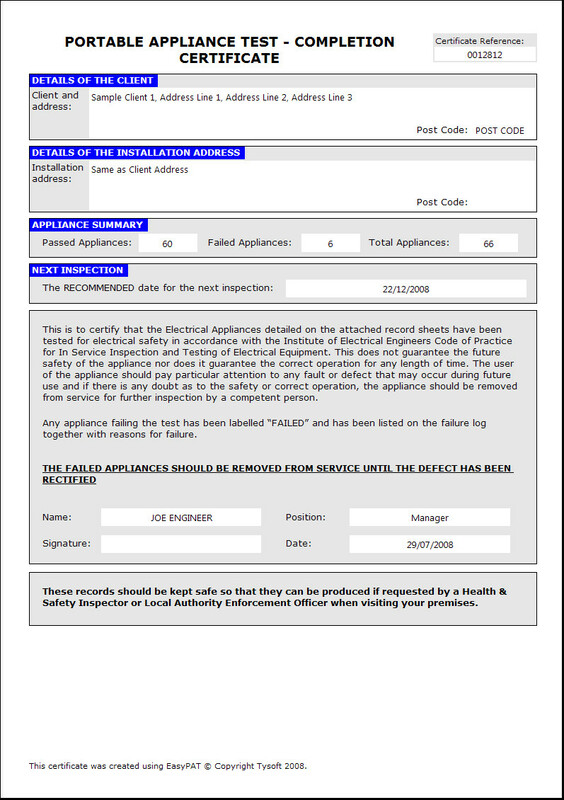 Attachments such as photos can also be added to appliances and printed with your reports if required. 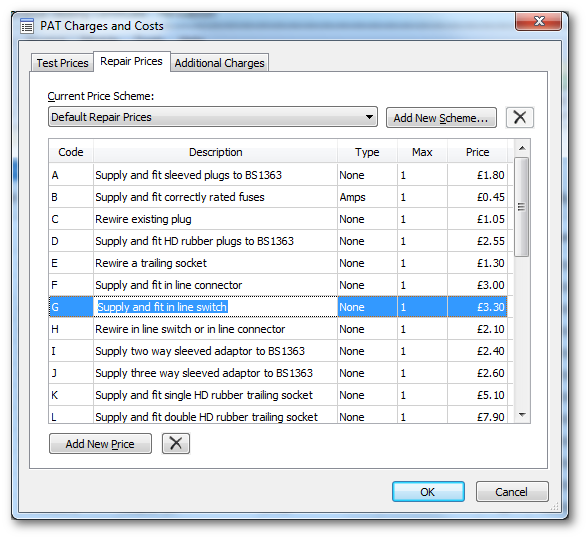 EasyPAT also allows you to configure charge codes and repair prices for each appliance which can then be used to automatically generate an invoice to be printed for the customer. 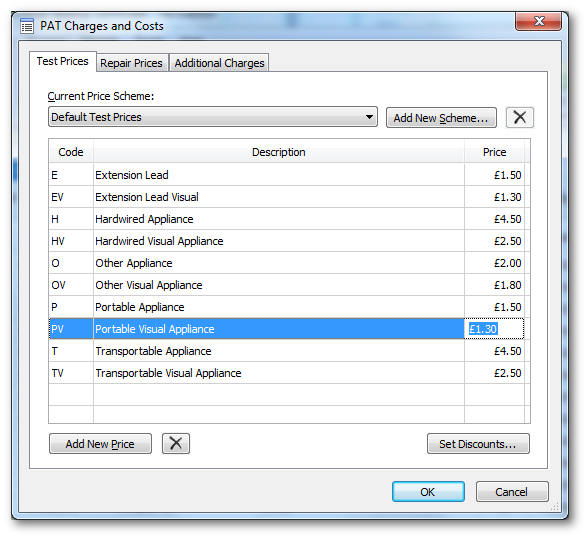 Different pricing schemes can also be setup within the software if you want to set different item prices based on how many appliances are being tested. 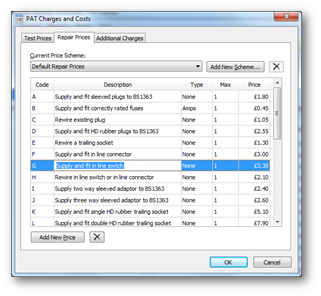 The screen shots below show both the Test Prices and Repair Prices configured within the software. 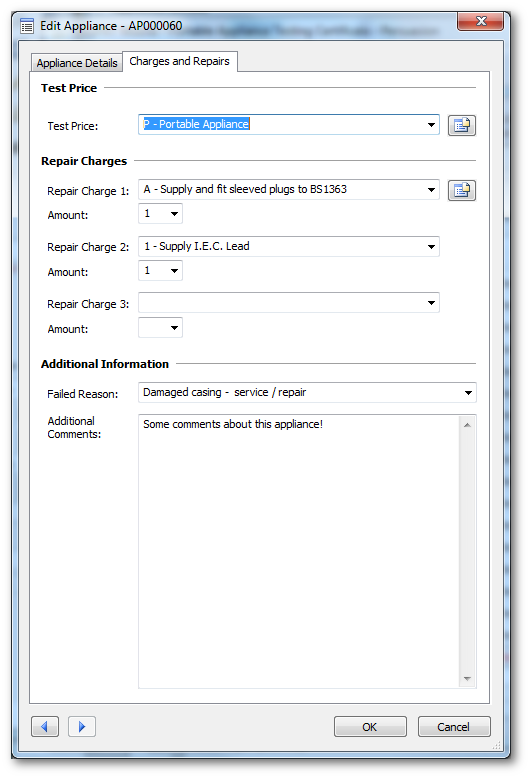 EasyPAT Mobile works with the EasyPAT desktop software to record and input all results direct onto your phone to be then imported into your desktop software. 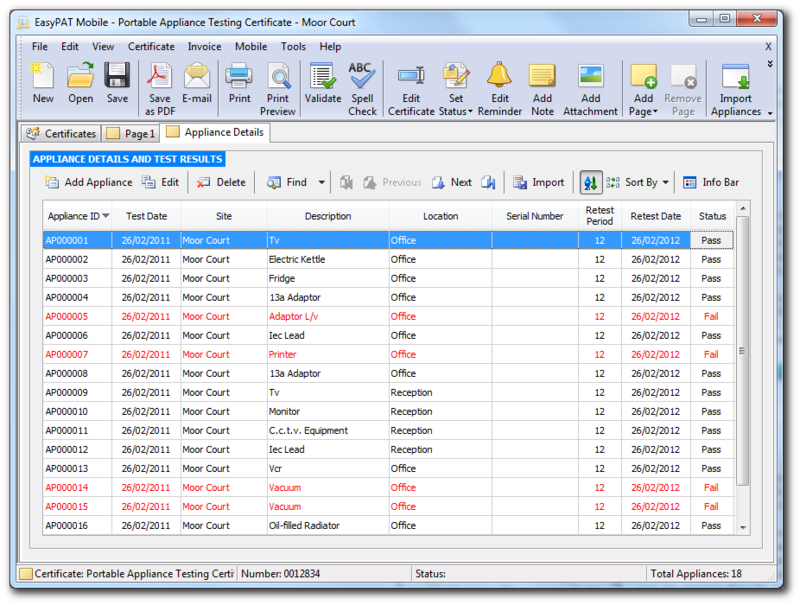 EasyPAT Mobile saves time and effort by not having to write certificates by hand onsite. 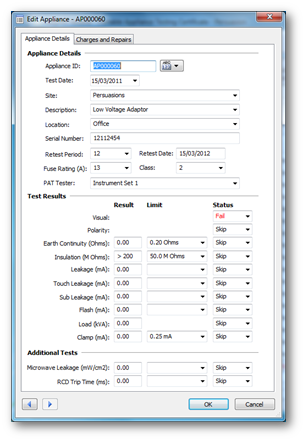 You only need to input the information once and you are set. 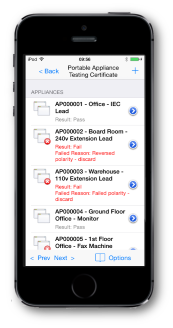 The powerful EasyPAT Mobile wizards walk you through each part of the certificate allowing you to enter the information as you go. 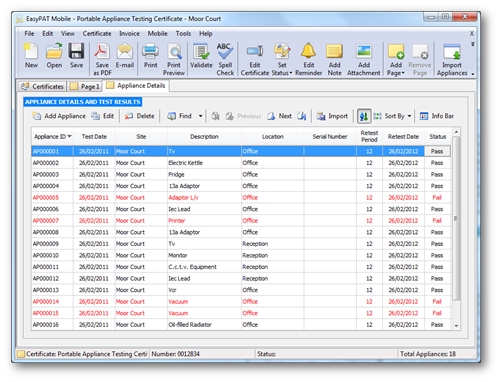 On completion of reports you simply upload certificates over your phones data connection, which can then be instantly downloaded direct into the EasyPAT desktop software. There is no messing around connecting your phone to your computer as everything is wireless making it quick and easy. 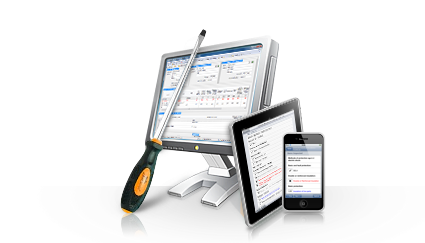 Click here for more information on EasyPAT Mobile. 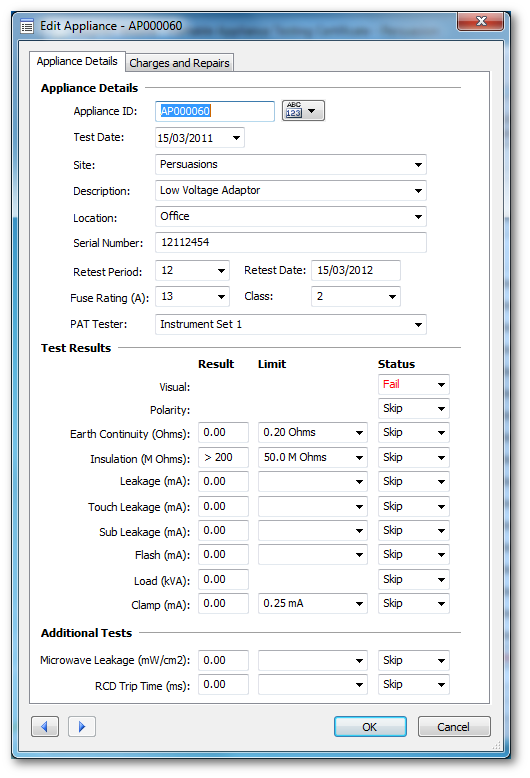 Listed below are some of the additional features also included within EasyPAT. 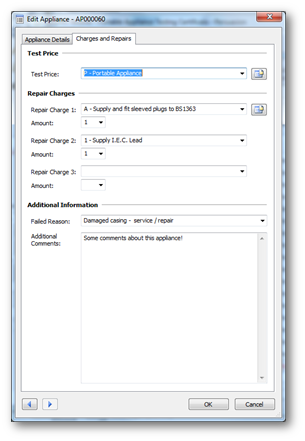 Find Appliances Quickly and Easily Support for Android tablets!